The 1989 Jeep Grand Wagoneer All Valley Handyman Service company truck has been putting in some overtime these days and can currently be found at the Rose Bowl Flea Market in Pasadena, CA on the second Sunday of every month. 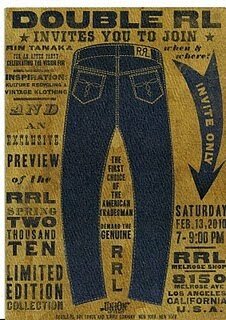 Rin Tanaka’s inspiration event held Friday & Saturday Feb 12 & 13, 2010 was the perfect jumping off point for the Sunday Feb 14, 2010 debut of our little slice of the vintage clothing pie known as The San Fernando Valley Mercantile Co. The focus is on vintage workwear from the 1940’s thru 1970’s. We’re off and running having sold some great old garments and made some great new friends. Stop by and check us out if you are at the Bowl, space # 5282. Here's a great old FINCK'S sign that we just sold this past month. Big thanks to Rin for all the inspiration and Ben from RRL for the hook ups. The Kogi truck at the RRL Melrose after party Saturday night was a real nice touch. Check David Himel’s blog The Art of Vintage Leather Jackets for a nice inspiration event recap. NICE BLOG !!! BRAVO !!! Thanks for stopping by and for the kind words. Beaucoup a apprécié!